Big life choices are never easy. And sometimes the fear of making a wrong choice can be paralyzing, leaving us in that state of status quo that can be alternately comfortable and stifling. The reality that choices I make can affect so many different people seems too often to escape me… until I start making mistakes. This week was an avalanche of human interaction where it seemed just about everywhere I turned I had made a choice that left someone angry, frustrated, or resentful. Now let me make this clear – most of the choices I’m talking about here are not ethical, moral, or issues of propriety – most of what I’m dealing with has to do with shades of pansies, timing of plant installations, or baby blanket colors. And it really started with a choice I made to leave my comfort zone and step into something a bit more challenging. And a part of that avalanche of human interaction on a more personal level started months ago when I chose to speak the truth to those I care about. Now, I won’t go into all the details of my terrible, horrible, no-good week. This is not a post to elicit empathy. This is about the result of owning my weaknesses and failures, looking at what really matters in life, and accepting the fact that living outside my comfort zone will sometimes and maybe even way too often leave me – why am I surprised by this – uncomfortable. So today I rode my bike, I enjoyed my garden, and I sat and looked for hours at growing up pictures of my precious sons. (And watched some football of course because it IS a Saturday in autumn). I thought of how blessed I am to be a mother. I thought of how fortunate I am to work in a profession that is fascinating to me and continually allowing me learn more. And as I walked through my garden, I realized that once again my garden had something to teach me about life and persevering through the hard times. Perseverance – walking through my garden I saw plants that had endured a blistering June and psychotic weather changes the rest of the summer. 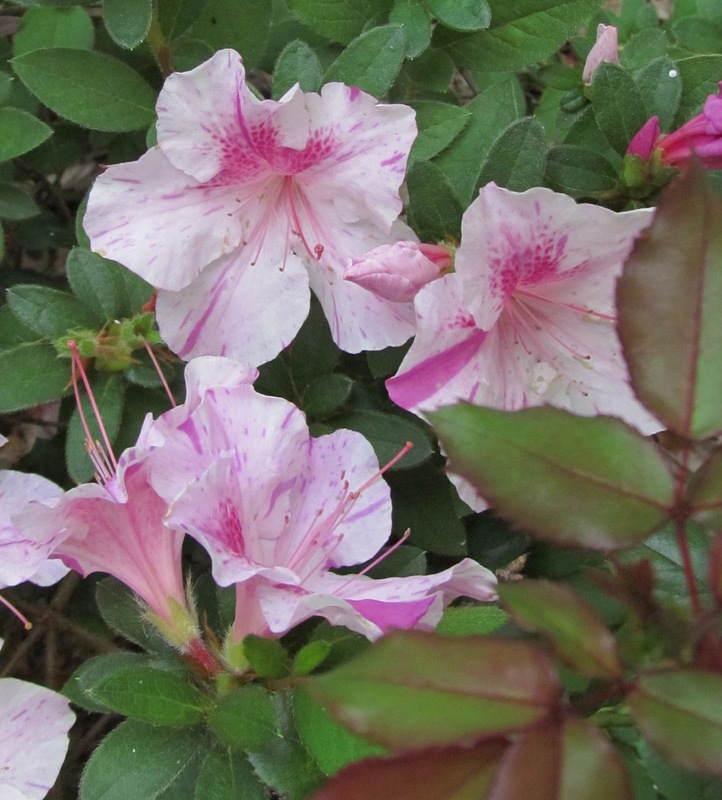 These Encore azaleas had the grandest display I’d ever seen in late fall, their girlie flirty delicate flowers seem a stark contradiction to the stress they had endured. The hydrangea plants are a spindly mess right now but are laden with several heavy blooms that stand out significantly against all the weary foliage around it. I love the new coreopsis that have come out these last few years – plants that hide how tough they are because of their airy foliage. Even now they keep on giving providing food source for our pollinators. Kerria japonica plenifora – graceful and happily blooming after months of neglect. Another variety of those wonderful new coreopsis “Fruit Punch”. Lobularia Blushing Princess – bloomed ALL SUMMER LONG! And this is the “big, old, wild shrub” that hubby couldn’t understand why I wanted to keep it. Until he sat on our back porch a couple of weeks ago and kept wondering what that delightful fragrance was. Yesterday I showed him what our scent of the season was – Elaeagnus (silverberry). The beauty of life is not always seen in every season. Pressing on with hope that the good will come, and maybe not as we expected – in a subtle fragrance rather than a showy flower – and my garden inspires me once again that in my weary and worn out state beauty can grow.